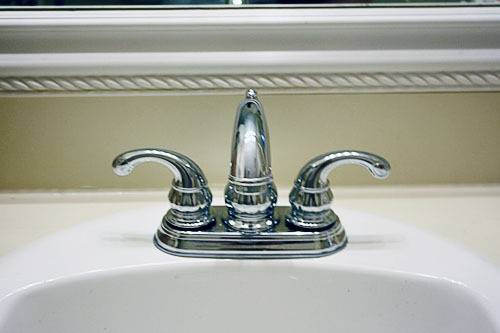 One of the things I never loved about our old house was the sink fixtures, both in the kitchen and the bathroom. They were 1990s builder basic, boring, and justhisside of outdated (plastic faux-crystal pull-on push-off knob? bleh). But we chose to spend money on more obvious upgrades, so they stayed. Here, though, the fixtures are updated and classic. So even though this may seem like a plain basic sink fixture, I think it’s swanky. 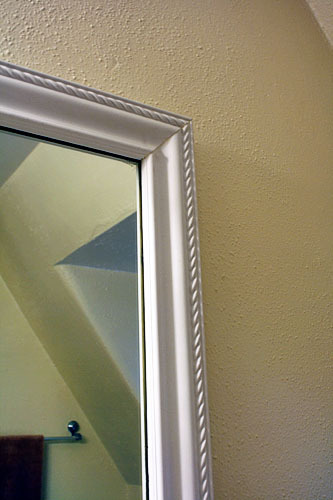 On the other hand, one upgrade I really liked in the old house was the trim around our builder-basic bathroom mirrors. Fortunately, we have that same classy little touch here. The trim style is different from the old house, and I might prefer the old trim just a bit more, but this is still classic and goes with the rest of the style of the home. I’ve been asked how to attach trim to plain mirrors, and I’m pretty sure that in this case, it’s just miter-cut trim, glued on the mirror surface, with maybe a bit of caulk in the corners. So simple! This pretty much guarantees that I’m spoiled by trimmed mirrors and will have to trim any un-trimmed mirrors in our future home.